Diploma in Mechanical Engineering from the University of Rome in 1990. MSc Quality Management from Cranfield University / UK in 1996. CEO in Hellenic Association for Quality since 1993, and successively in TUV Rheinland Hellas until 2004. 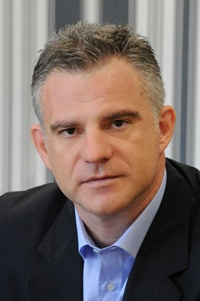 From 2004 to 2009, member of the Greek Government, first as Executive Secretary for Operational Programmes - Ministry of Health & Social Solidarity, then Secretary General of Public Health - Ministry of Health & Social Solidarity, year 2007 Secretary General for Industry - Ministry of Development, and from January 2009 as Secretary General of Tourism - Ministry of Tourism Development. Since October 2009, I work internationally in the private sector, on the field of Industrial Inspections, while officiate Executive Secretary of the Non Profit Organization, Greek Welding Institute. Since May 2015, I am the International Business Development Manager in Swiss Approval International Inspection and Certification Body. International Standard Medical Tourism Friendly Hotel (MTFH) requirements framework, appendix to ISO 9001, June 2013.
International Standard HSTAR 1: Hospitaity and Hosting services Certification for Guest's Safety "Blue Service". December 2014.
International Standard HSTAR 2: Hospitality Certification for Health Tourists' and Sensitive Guests' Safety "Blue Service for Excellence". May 2015.